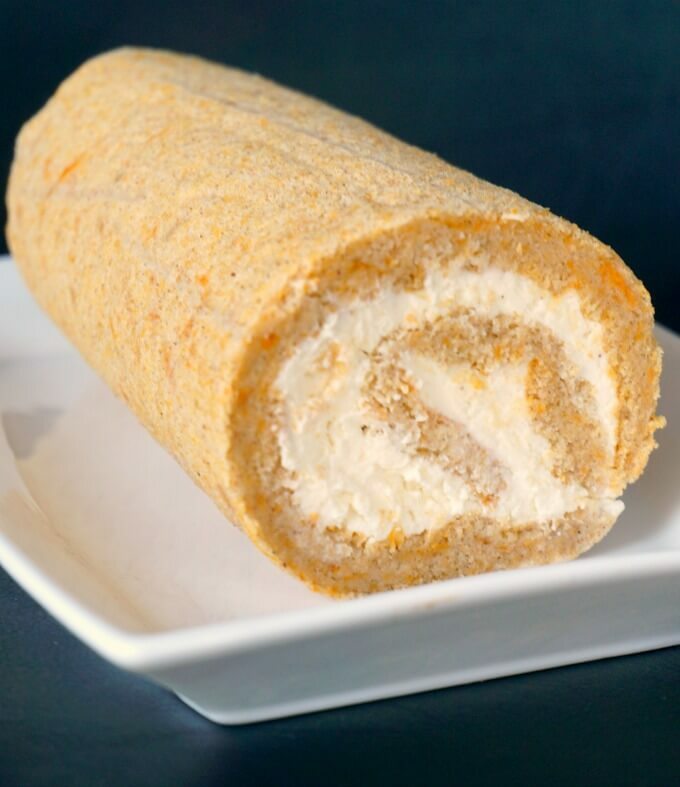 Pumpkin Roll with Cream Cheese Filling, the best Fall dessert that will be the star of your Thanksgiving dinner party. A light sponge made with pumpkin puree and a nice blend of pumpkin pie spice, plus a silky maple cream cheese filling, what a treat! Is it Pumpkin season yet? Well, maybe not yet, but, I am sooo looing forward to it, that I could not help myself, I had to start my everything pumpkin baking already. It might still be summer, although over here in the UK we are finally getting some well-deserved rain now, after a scortching summer that make us all appreciate these rainy days better. And since it’s cooled down quite a lot, there is nothing stopping us from thinking of pumpkins, harvest, Halloween, Thanksgiving, and all Fall fun. Yes, summer is fun, but, just think about it, lots and lots of yummy pumpkin treat winking at you from everywhere. That for me it’s more than enough to look forward to these happy days. And my pumpkin roll with cream cheese filling is the best start to my crazy Fall baking. 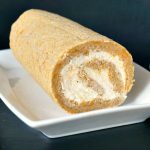 It has the perfect blend of pumpkin spice that goes so well with the delicate texture of the maple cream cheese filling. I have used this yummy filling before with my Pumpkin Whoopie Pies with Maple Cream Filling and I fell in love with it. 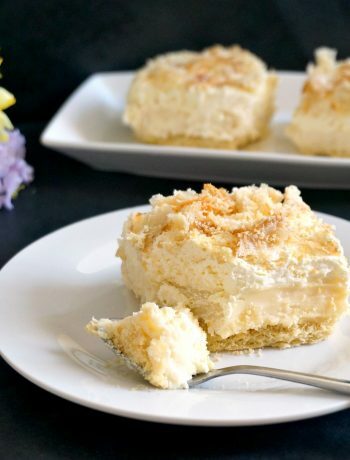 And what’s great about it is that you can use as much or as little sugar as you like, the cream cheese makes it naturally sweet anyway, so I find there no need for much refined sugar at all. If you don’t have pumpkin pie spice blend, you can actually make it at home yourself, just play with the amount of cinnamon, cloves, all spice, ginger and nutmeg you like to use, and make your own very special blend of perfect spice that can be used in lots of pumpkin recipes. And, if you don’t have fresh pumpkin just as yet, and can’t get the canned one, the pumpkin can be easily replaced with sweet potatoes, or even butternut squash. The taste and texture can be similar, and it gives you more choice when it comes to creative dessert ideas. The sponge is super easy to make, and it comes out of the oven in about 15 minutes or less. 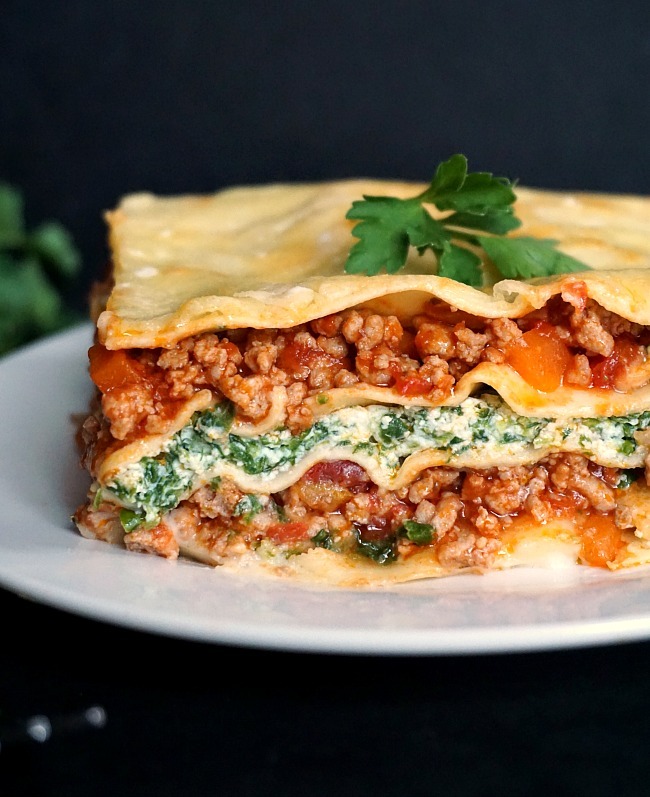 It’s light, super yummy, and it has the perfect texture to be rolled without breaking easily. Not to mention the cream cheese filling, which is literally ready in 2 minutes. It’s just a matter of mixing the ingredients, and ta-daaah, an awesome cream filling to knock your socks off. 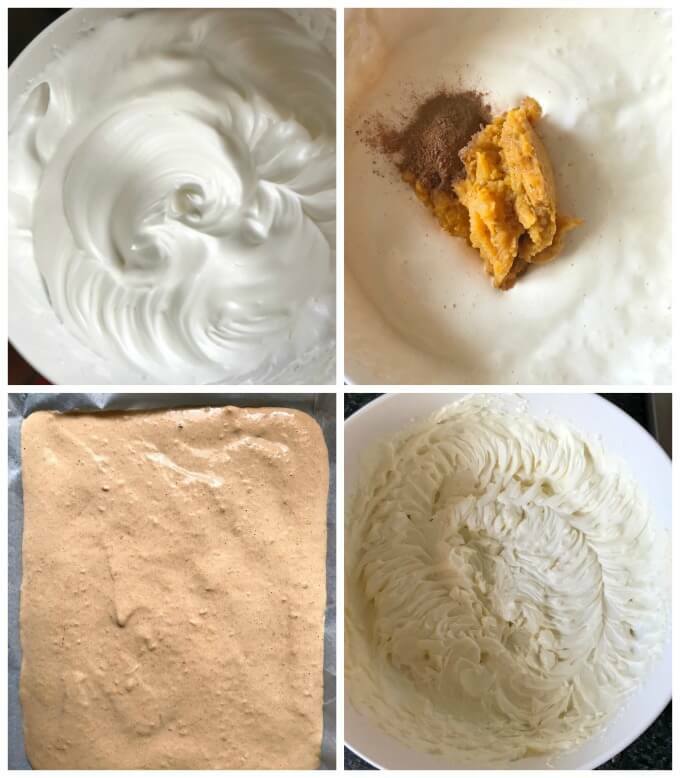 ONE TIP HERE – do let the sponge cool down before adding the cream cheese filling to it, otherwise you will end up with a big mess, and the roll is look rather bad. Patience really is a virtue when it comes to baking!!! 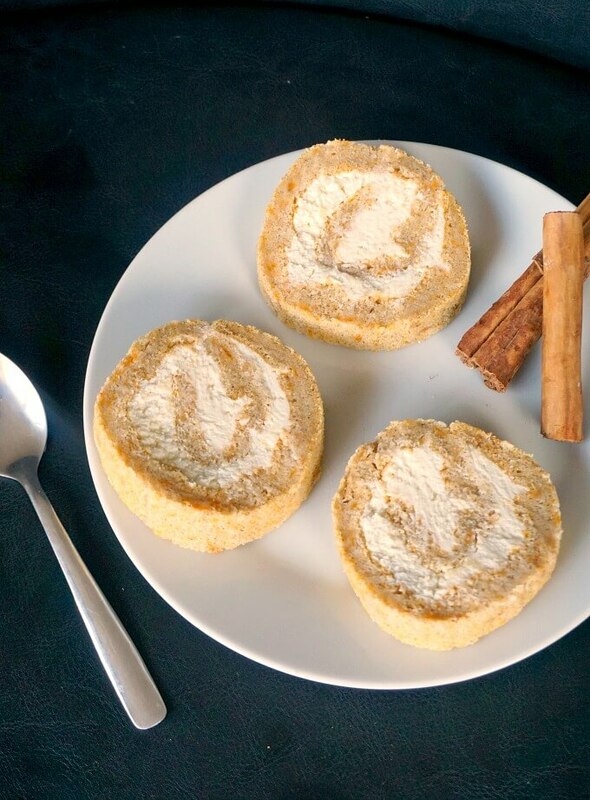 If you’ve liked my PUMPKIN ROLL WITH CREAM CHEESE FILLING or any other recipe on the blog then don’t forget to rate the recipe and let me know how you got on in the comments below, I love hearing from you! You can also FOLLOW ME on FACEBOOK, INSTAGRAM and PINTEREST to see more delicious food and what I’m getting up to. To make the sponge, separate the egg yolks from the egg whites. Beat the egg whites with a pinch of salt until they hold soft peaks, then add the sugar and continue to mix until you get stiff peaks. Add the egg yolks, and mix well to combine. Add the sifted flour, cinnamon, pumkin puree, pumpkin pie spice, vanilla extract and oil, and mix everything well. Line a baking tray (35cm x 24.5cm, or 13.7 x 10 inches) with non-stick perchament paper, then spread the batter and bake for about 12-15 minutes until the top springs back to touch and a tooth pick inserted in the middle of the sponge comes out clean. Carefully roll the sponge, keeping the baking paper on, then leave the sponge to cool completely. To make the cream cheese filling, beat the butter with the sugar, then add the cream cheese and maple syrup and mix well. Refrigerate until ready to use. Once the sponge has cooled down, carefully remove the baking paper, unroll it, then spread the cream cheese filling, and roll again. Refrigerate for about one hour before slicing. Serve cold. From one roll you can get about 12 slices.